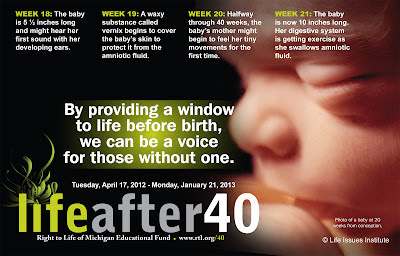 Halfway through the 40 weeks of pregnancy, the baby’s mother might begin to feel her tiny movements for the first time. Abortion survivor Melissa Ohden, who spoke at Right to Life of Michigan's 2012 Legislative Day, is appearing in a new ad from the Susan B. Anthony List about President Obama's votes against the Illinois Born-Alive Infant Protection Act when he was a state senator. Rich Lowry discusses President Obama's extreme position on abortion in a recent column including Obama's voting record and his statements to abortion advocates. He opposed a partial-birth abortion bill in Illinois, even as the federal version passed the House with 282 votes and the Senate with 64 votes and was signed into law by President Bush in 2003. He arrived in the U.S. Senate in time to denounce the Supreme Court's ruling upholding the ban. In 2007, he told the Planned Parenthood Action Fund that his first act as president would be signing the Freedom of Choice Act. The act would enshrine in federal law a right to abortion more far-reaching than in Roe v. Wade and eliminate basically all federal and state-level restrictions on abortion. This isn't a point its supporters contest; it's one they brag about. The National Organization for Women says it would "sweep away hundreds of anti-abortion laws [and] policies." During the nineteenth week of pregnancy, a waxy substance called vernix begins to cover the baby’s skin to protect her from the amniotic fluid. At Public Discourse, 2012 Right to Life of Michigan Conference speaker Michael New reviews a book entitled, A Shared Vision by Jane Gilroy. The book shares the story of Ellen McCormack, a prolife pioneer from New York who ran in the Democratic presidential primaries in 1976 and 1980 and used the money she raised to air prolife television commercials. In the end, Ellen McCormack’s campaign exceeded expectations. She ran in 18 primaries and received over 200,000 votes, 1.4 percent of the total votes cast. Her success in the primaries earned her 3 pledged delegates to the Democratic National Convention. At the convention, she received both a nominating speech and a seconding speech. When the results were tallied, she received 22 votes from the convention delegates. Her campaign educated many people about abortion and demonstrated that a sizeable contingent of Democrats was willing to support a single-issue pro-life candidate. During the eighteenth week of pregnancy, the baby is 5 ½ inches long and might hear her first sound with her developing ears. Where do Michigan's U.S. Senate candidates stand on human life? We've created an educational comparison piece which compares and contrasts Pete Hoekstra's and Senator Debbie Stabenow's positions on life issues including their positions on abortion, taxpayer funding of abortion, abortion in health care reform, partial-birth abortion and prenatal protection. Feel free to print and distribute this piece. Where do the U.S. Senate candidates stand on human life? According to a press release from National Right to Life Committee, Nellie Gray, the founder of the March for Life, has died. Today, National Right to Life joins with prolife activists across the county in mourning the loss of Nellie Gray. She was a tireless advocate for the unborn, best known for founding and maintaining the annual March for Life in Washington, DC. Every year the March brings tens of thousands of prolife advocates together from across the nation on the anniversary of Roe v. Wade. On July 20th, a 24-year-old woman named Tonya Reaves was pronounced dead at Northwestern Memorial Hospital, leaving behind a fiancée and a one-year-old son. About twelve hours earlier she received a dilation and evacuation abortion at a Planned Parenthood abortion clinic in Chicago. According to Planned Parenthood’s web site, dilation and evacuation abortions typically take between 10-20 minutes and then women recover for about an hour. In Reaves’ case there were bleeding complications and she was kept at Planned Parenthood for more than 5 hours before she was taken to the hospital. While the coroner has yet to release Reaves’ official autopsy, statements suggest the abortionist at Planned Parenthood botched her abortion, leaving pieces of her unborn child inside her womb, and perforated her uterus, which eventually led to bleeding which was called “uncontrollable” an hour before her death. Why did it take 5 hours for an ambulance to arrive when this procedure and its recovery typically take an hour and a half? If Planned Parenthood had called for an ambulance sooner, would Reaves still be alive? These are questions Reaves’ family asked after they lost their loved one. In response, Planned Parenthood issued a statement which admits no responsibility and lauds the supposedly “high safety record” of abortion. Tonya’s death is a tragedy which touched the lives of many. Every successful abortion ends the life of a baby preparing to be born and with every abortion there are risks. Potential complications for abortion include, but are not limited to, bleeding, hemorrhage, infection, uterine perforation, blood clots, cervical tears, incomplete abortion, and cardiac arrest. Help is available for mothers and families facing an untimely pregnancy. Pregnancy help organizations and people around the state are ready and willing to provide assistance. Pregnant women in Michigan are never alone. 1-800-57WOMAN is a toll-free hotline which women can call anytime day or night to be connected to a caring, confidential help agency. Right to Life of Michigan also provides a complete listing of pregnancy and adoption services at www.rtl.org. On August 11, Republican presidential candidate Mitt Romney selected Congressman Paul Ryan to be his vice-presidential running mate. Congressman Ryan has served in Congress since 1999 and has a 100% prolife voting record. National Right to Life Committee praised Romney's pick of Ryan to be his running mate. NRLC also links to an editorial which Paul Ryan wrote in 2009 sharing his prolife beliefs. In July of 2012, Paul Ryan told the Weekly Standard that he would always vote prolife. "I’m as pro-life as a person gets," Ryan continued. "You’re not going to have a truce. Judges are going to come up. Issues come up, they’re unavoidable, and I’m never going to not vote pro-life." On November 6, Michigan voters will have a chance to replace U.S. Senator Debbie Stabenow, who does not represent Michigan's prolife values, with a prolife U.S. Senator who does. Sadly, during the past 10 years in the U.S. Senate, Debbie Stabenow has a 0% prolife voting record from the National Right to Life Committee. Pete Hoekstra respects the dignity of human life and will proudly represent Michigan and defend human life in the U.S. Senate. In the seventeenth week of pregnancy, fat begins to form to keep the baby warm and cozy after birth. 23%. That's the percentage of Michigan voters who actually voted in the 2010 primary election. Take this opportunity to make your voice count in today's primary! How does abortion effect the economy? To answer that question, we've produced a new fact sheet entitled, "Destroying Our Future: Abortion's cost to our economy." This fact describes how abortion contributes to the unsustainability of entitlements, increases health care costs, reduces the number of children in schools and destroys innovation. Are you surprised to know that only 23 percent of registered voters in Michigan chose to participate in the 2010 primary election? In comparison, 19.8 percent of registered voters participated in the 2008 primary. We all know that elections have consequences. The men and women who represent us at the local, state and federal levels of government make decisions which impact our lives. Some of these decisions also impact whether or not a baby preparing to be born sees the light of day. If you are registered to vote, make plans now to participate in the process. It is undeniable that every life has meaning and so does every vote. Make your vote count! The Right to Life of Michigan Political Action Committee endorsed prolife candidates are committed to making a prolife difference. All RLM-PAC endorsed candidates have been carefully screened, interviewed and have signed a written questionnaire stating their support for prolife legislation. These women and men of conscience understand the value and dignity of every human life and deserve our support and vote. Be part of the percentage of people who are making a difference. Vote for prolife candidates on August 7. Special Reminder: For the August 7 primary election, you must vote in either the Democratic primary or the Republican primary. During the sixteenth week of pregnancy, an ultrasound at this point would reveal the baby moving her legs and arms and maybe even sucking her thumb. It might also be able to determine her gender. The U.S. House voted 220-154 in favor of the D.C. Pain-Capable Unborn Child Protection Act last night. The bill failed to pass because a two-thirds vote was needed under "suspension of the rules." The two-thirds vote would have been necessary to overturn President Obama's likely veto of the bill, which would ban abortions past 20 weeks in our nation's capital. Some representatives were unable to vote because their planes were delayed as they tried to fly into Washington, D.C.